Watching Russell Crowe’s directorial debut, The Water Diviner, there’s a sense that in another era the film might have been a vehicle for a Gary Cooper or Errol Flynn type. It’s a modern movie that’s decidedly old-school, unapologetically melodramatic and epic in both the scope of its story and the scale of its production—that the film is unevenly made scarcely matters (though for many, Crowe’s craft and narrative choices might be a dealbreaker). He likes overhead shots—like really, really likes them—and at times it seems he struggled to pick what footage to leave in and to cut out. The editing is rough. The tonal shifts from romance to wartime thrills are rougher still. But adventure awaits across multiple continents, springing from a place of personal pain and transitioning into a tale of fatherhood’s rigors and male camaraderie. 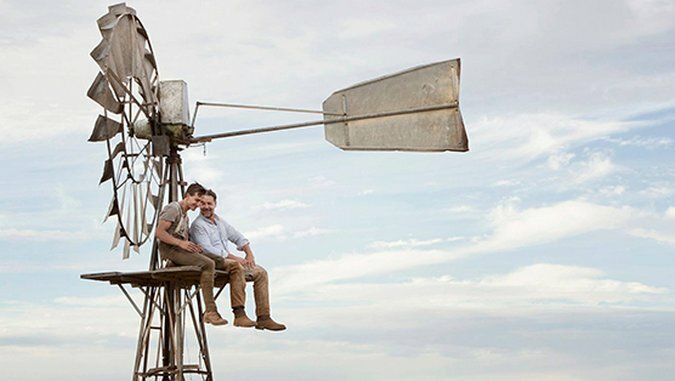 It’s appropriate that The Water Diviner should find its roots in deep, intimate reserves of anguish: The film’s protagonist, Joshua Connor (Crowe), has an innate knack for discovering groundwater in his arid Australian backyard. When he does, he digs, he excavates, he cracks the very earth until it gives up its liquid bounty. So too does Crowe’s story chip away at the exterior of Joshua to show us the character’s innermost remorse. (Now that’s a metaphor, right?!) Joshua, we learn, lost his three sons in the Battle of Gallipoli four years prior; next he loses his grief-stricken wife (Jacqueline McKenzie) when she drowns herself in a grim inversion of Joshua’s gift. With nothing left for him in the Outback, Joshua travels to Turkey, where he takes up residence in an Istanbul hotel renowned for its paucity of German clientele. He’s determined to find his children’s bodies, bring them home and inter them alongside their mother. Nothing is as easy as that, of course, because the battlefield where the Connor boys met their demise is the subject of a mass burial detail led by lieutenant colonel Cyril Hughes (Jai Courtney) and Turkish officer Major Hasan (the great Yilmaz Erdo?an). Here, The Water Diviner begins in earnest: Hasan and Hughes are moved by Joshua’s plight and endeavor to help in his quest. Their act of decency expands the film into a larger canvas of politicking and intrigue. Soon, Joshua is on the run from British military officials and invading Greeks, all in the pursuit of redemption. The film’s range suits it. As a director, Crowe has an eye for sweeping expanses and close-ups, swapping back and forth from grander portraits of his locations (he shot in both Australia and Turkey) to the tightly-hewn framing of his cast; it’s a nod to the global concerns of the plot, the emotional suffering of the characters and maybe even a Sergio Leone Western or two. Occasionally, The Water Diviner goes in too much and Crowe accidentally cuts a few inches off the top of his actors’ crowns, but in a weird way these little stumbles wind up being endearing, even if they’re intended. Crowe believes in his picture, and he believes in the story he’s adapted from the novel written by Andrew Anastasios and Meaghan Wilson-Anastasios. (Andrew had a hand in penning the film’s screenplay, too.) If he isn’t exactly seasoned in the discipline of making movies, he’s no less invested in the project for it. As a result, The Water Diviner is keenly felt regardless of its sloppy construction. Most of all, it’s terrifically acted. Crowe in particular is outstanding, though he’s never better than when emoting alongside Erdo?an. They have a genuinely warm screen relationship together, so much so that if they never team up for a movie again it’ll be a big crying shame. Hasan’s empathy for Joshua’s plight instills The Water Diviner with needed humanity, much in the same manner as the interactions Joshua has with widowed hotel owner Ayshe (Olga Kurylenko, wonderful but perhaps miscast). There’s a love affair brewing between them, a necessary contrast to the platonic bond Joshua develops with Hasan, but the film holds back rather than force them into requisite scenes of amour. Ayshe even undercuts the script’s white savior complex in one of the movie’s more refreshing flourishes. The Water Diviner lacks in filmmaking prowess, but this is a movie that’s acutely tuned-in to the sensation of experience. The horrors of war, the pain of reconciliation, the process of turning enemies into friends: Crowe doesn’t just enact these elements, he believes in their power. Boston-based critic Andy Crump has been writing online about film since 2009, and has been scribbling for Paste since 2013. He also contributes to Screen Rant, Movie Mezzanine, and Badass Digest. You can follow him on Twitter. He is composed of roughly 65% Vermont craft brews.